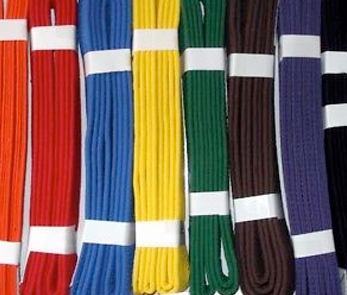 "it's the journey, not the belts"
Martial arts belts are a means of recording progress, They are a visual representation that the wearer has undergone some test - they are not an infallible indication of proficiency. Belts are not interchangaable across arts. A blue belt in Karate does not denote the same experience as a judo or BJJ blue belt. We run a syllabus incorporating 8 belts - some other arts have 10 or more. These are usually a device for increasing income. We do not operate regular, 3 monthly gradings, and we do not grade anyone under 18 to black belt. Black belt candidats require a strength of personality and intrgrity that only comes with maturity. In addition there is a ridiculous notion that owning a black belt automatically qualifies you as a teacher - it doesn't!